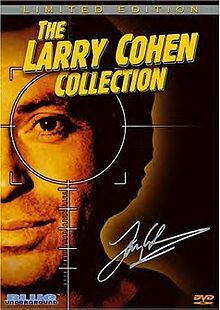 We were lucky enough to speak with Larry Cohen recently for Low Budget Legends. Larry is not just a low budget legend. He is just a legend — period. He is the director is such moveis as Bone, Black Caesar, The Private Files of J. Edgar Hoover, Full Moon High, and A Return To Salem’s Lot. Well, I went to the movies as a kid. That’s how. As soon as I saw movies I fell in love with ’em and– knew I– knew I wanted to do that someday. How much did it cost to make your first movie? The first movie that I directed? Was– was– $225,000. That’s what they paid for the picture. That’s what I got for the picture. I don’t remember how much it cost me but I made a profit. So I probably made about $80,000 on that. So if you subtract the $80,000 from the $225,000, I guess that’s what it cost me to make the picture. Oh, I don’t know. People made pictures cheaper than that. But we had good actors. We paid them fairly. And– it was in color, and it was– 35 millimeter. It wasn’t 16. And– it was– you know– a first-quality– Panavision equipment. And– so, you know, we– we– we tried to do a quality job on the film. It could’ve been done a lot cheaper. And what was the name of that movie again? So, this is for our website, Low Budget Legends. We’re really interested in low-budget filmmaking. What is the thing that you would never skimp on in making a movie? And what is the one thing that you would never pay for? What do you mean, “Never pay for”? you like– like, you’d never pay– for- a makeup artist? I mean, I don’t know. I don’t know understand the question. I really don’t know what you’re talking about.